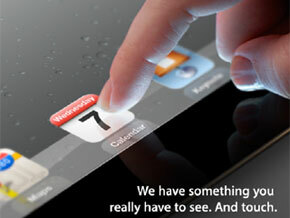 Apple unveiled its new iPad, amid months of speculation and rumors. SAN FRANCISCO ( TheStreet) -- Apple ( AAPL - Get Report) announced its new iPad, simply called iPad to thousands of onlookers in California. TheStreet live-blogged the event, which was held at the Yerba Buena Center for the Arts Theater. Apple's invitation, sent out earlier last week, featured part of a tablet screen, confirming expectations of a major iPad announcement. "We have something you really have to see. And touch," it added. The new iPad featured Retina Display, an updated processor for improved speed and computing power, a QXGA 2,048 x 1,536-pixel display, voice recognition software, enhance iSight camera, and 4G Long Term Evolution (LTE) capability. In the U.S., the new iPad will run on the 4G networks from AT&T ( T and Verizon ( VZ. The gadget is expected to continue the tech giant's upward trajectory. Apple, whose shares have recently been hitting new highs, sold a record 15.4 million iPads during its recent fiscal first quarter, up from 7.3 million in the same period last year. >To follow the writers on Twitter, go to http://twitter.com/jamesjrogers and http://twitter.com/commodity_bull.